“Noisy” said Federal Open Market Committee (FOMC) Chair Janet Yellen regarding the Consumer Price Index (CPI) data for May. And the markets moved. Should this have surprised markets? Q: What is “noisy” data? A: Data are often noisy due to short-term factors or data quality, so one month is not a trend for those economists who measure change in years and decades. Also, because of lags and unintended consequences, the FOMC is cautious about reacting to transient data. Q: Why is CPI considered noisy? A: In addition to significant fluctuations, wide differences in individual price components (autos, food at home, apparel) are among the reasons. Q: What may be noisy about the CPI data for May? 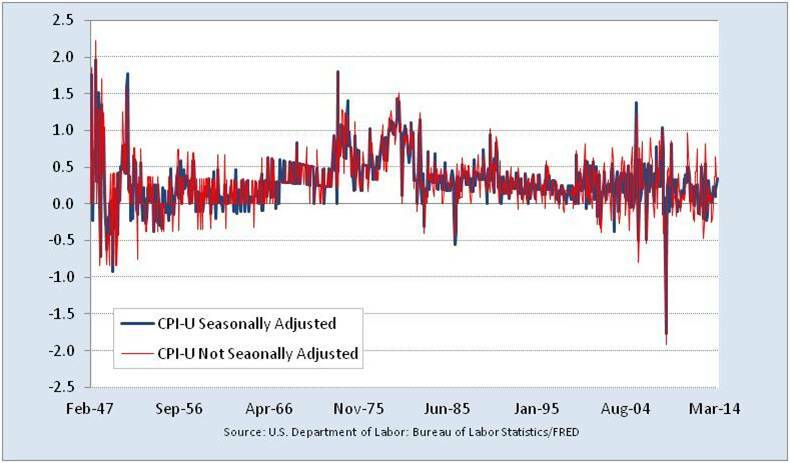 A: The CPI data for May <http://www.bls.gov/news.release/cpi.nr0.htm> from the Bureau of Labor Statistics reports an increase in prices associated with food and energy, while the 12 month increase for Commodities Less Food and Energy Commodities was -0.2% and Apparel was 0.8%. Q: Were the May CPI prices increases unexpected? A: Early warning of CPI increases is often seen as items pass through stages of production. In the May BLS Producer Price Index (PPI) data http://www.bls.gov/news.release/ppi.nr0.htm, analysts noticed a spike in food and foodstuffs at all stages of production. By May, prices were down. A drop in supply available at any price, such bad crop harvest, war cutting oil production or shortage of computer hard drives after Thailand flooding. An increase in demand at any price faster than output can increase due to manufacturing limits or scarcity of commodities, such as growth in China or India consuming a greater fraction of global oil. Production costs or margins increase faster than buyers can cut back consumption. Bullish consumers with fists of cash bidding up prices faster than suppliers can grow output. In any consumption-based estimate, the source of price increase matters to economists because different causes are more or less easily addressed by monetary policy. Attempting to slow individual prices through tighter US monetary policy (through tools such as fewer securities purchases or higher interest rates), doesn’t have much effect on oil pipeline policy or growth of chickens. Monetary policy is more useful for generalized inflation with a monetary cause. For example, money supply, and related credit-sensitive investment or consumption. In the face of these price increases, real wages have been flat for the past year http://www.bls.gov/news.release/realer.t02.htm and consumer credit increased (at about 6%, with revolving credit growing at a more modest 1%, before at 2.4% spike in April). A tricky situation for the FOMC might be responding to both higher prices for goods facing scarcity and flat prices for goods from industries facing slack capacity. Services add another dimension with differences between those with and without heavy international competition. FOMC prefers the broader Personal Consumption Expenditure deflator. Next Article GDP estimate revision – who knew what when?